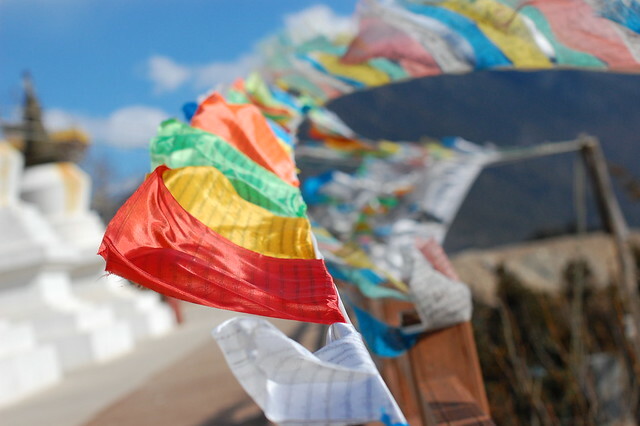 We are all mesmerized by the vibrant, colourful flags of Tibet that are known to bring good-luck. The Prayer Flags of Tibet are not just decorative items, but have many facts that we do not know. Lets highlight some of those Tibetan Prayer Flags Facts. The flags are of red, yellow, white, blue and green which symbolize the five elements. Red means fire, Blue means Wind, Yellow means Earth, White means Air and Green means Water. They also represent the directions- North, South, East, West and Center. Most of the traditional prayer flags are designed with the Wind Horse along with mythical creatures such as Dragon, Garuda, Lion and Tiger. It is said that these animals carry the message of blessings to all the corners of the world. Om means- the sacred syllable, Mani means- jewel, Padme means- lotus and Hum means- spirit of enlightenment. This sacred mantra has a deep meaning that is capable to take away our anger, hatred, greed and aggressive nature if we recite this while meditating. You will become wise, compassionate and patient if you truly learn to believe this mantra. You should not keep the flags still as it will not give out the positive effect that way. Always keep the prayer flags high above on the rooftops so that the winds can carry the good luck and blessings all around. This is how the positive energy is carried away and spiritual vibrations are spread. Did you know that these flags are very auspicious? If you are gifted one of the prayer flags you should feel special. You can also gift your friends these beautiful flags. If you wish to present someone health and harmony then a Tibetan Prayer Flag is a great choice. They are known to bring peace in our life. Lung Dar are the horizontal flags and Dar Cho are the vertical flags. The prayer flags are typically hung in horizontal way or are displayed using vertical poles. You always need to have a set of five comprising of red, yellow, green, blue and white. Remember before you hang the flags you must make sure of these colours as it is essential that you use the set together. You may also use one flag made with the five distinct colours. The poles have sometimes written sacred mantras on it. It is a way to make the power of the flags more. It is completely disrespectful to keep a prayer flag on the ground. So, never keep them on the ground or any lower height areas. Make them fixed to the roofs. Consider keeping them on the frame of the doorway. If you find the prayer flags fading its colours then it is a good will. It means that the wind has successfully carried its auspicious blessings all over. So, the sign of fading is nothing to feel low. Hanging Tibetan Prayer Flags bring positive atmosphere all around us. Yet hanging it in the right place is the most important thing. You should always know when to and where to put them. According to Tibetan calendar there are auspicious and inauspicious days. You need to learn about the date and time before you hang a flag. Putting prayer flags on wrong astrological dates will only cause more harm than good and you will face obstructions in your life. So, you should make sure that your prayer flag is hung on the right date on a particular month. It is a common misconception that these colourful flags are used to send prayers and messages to gods. In reality these prayer flags are used to spread good will, positive luck and love all over the place. The wind that carries the prayer of these flags happen to touch all the living and non-living beings of this world and spread its compassion. Most of us do not know how to dispose a prayer flag. It is of utmost importance to make proper arrangements before disposing a Tibetan Prayer Flag or else you will only disrespect the value of the flag. The best way to dispose them is by burning. But make sure that the flags do not touch the ground while they are burning. The smoke from the burning flags carries sacred blessings. Another way is to let them get old, fade away and slowly disintegrate. Put a new flag along with the old one. This is a symbol of the continuation of our births and deaths. Tibet is a wonderful land and the Tibetan Prayer Flags are the integral part of culture, tradition and religion. In today’s world lack of peace and harmony causes tension among people. So let’s embrace this holy prayer flag and spread good luck. Here were 10 Tibetan Prayer Flags Facts, hope this article helped.